Grant Wythoff's new collection of Hugo Gernsback's writings is an indispensable volume for students of science fiction. There's a profound optimism at the heart of the life and work of Hugo Gernsback, famed progenitor of the literary genre known as science fiction, a belief that the human mind, combined with hard work and a good bit of tenacity, can transform the human world through the transformation of material things. In his essay from 1916, "The Perversity of Things", Gernsback confronts the stubbornness of the physical world, its seeming unwillingness to bend to our will. Things themselves are not truly perverse, he argues; what is perverse is our inability, or simple unwillingness, to understand those things, to study them and carefully plan their transformation into the tools that we need, and to remain steadfast and patient on the long and difficult road required for the development of the useful and the true. "Why does the eternal wisdom of nature, seemingly always interpose obstacles in his way whenever man desires to invent or construct a certain new thing?" he wonders. "The answer is that it does not. It is not the things that are perverse, it is ourselves who make them seem perverse." Grant Wythoff's new collection of Gernsback's writings, with his insightful introductory essay, is an indispensable volume for students of science fiction. Gernsback, famously the founder and editor of the pulp science fiction periodical Amazing Stories, comes alive under Wythoff's curation. 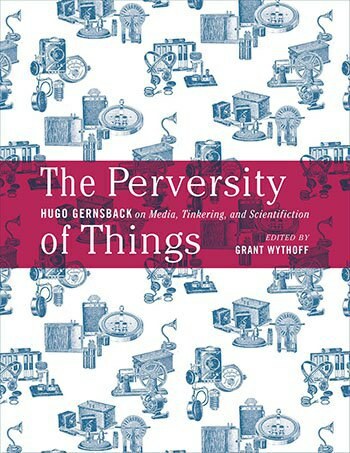 For readers like myself, who know Gernsback only for his role in the creation of science fiction, or "scientifiction" as he named it, and as a proponent of a science-based style over fanciful planetary romances, The Perversity of Things is an eye-opening read. Gernsback's scientifiction, it seems, is a product of his optimism, of his belief that human effort, in the form of technological discovery and innovation, is a wellspring for the growth and development of the human race. Gernsback, before he was a science fiction editor, was a tinkerer and inventor and a man who believed that tinkering and invention would shape the future. He began his publishing career with the Electro Importing Catalog, a source for tools and devices, both legitimate and crank. From there he published Modern Electrics, The Electrical Experimenter, and Radio News, publications aimed at amateur tinkerers who, Gernsback seemed to believe, were Edisons in waiting. With all of this hope for what the future might bring, for how we can overcome our own perversity of ignorance and carelessness, speculation about what that future might look like and what sort of things we humans might populate it with was a natural fit. As Wythoff observes, Gernsback's publications give "equal space to the soberly technical and the wildly utopian." He also notes that "Long before Gernsback founded Amazing Stories, these magazines and their readers used speculative thought to find a language suited to the analysis of emerging media like radio, television, or the more exotic osophone or telagraphone." The man known as the founder of science fiction ("Uncle Hugo," to his fans) is also, in Wythoff's keen telling, "the father of American electronic culture." Carefully selected from Gernsback's long career, the readings in The Perversity of Things mange to show just how much Gernsback's and his readers' optimism about science, or at least technical innovation, is at the very heart of the birth of science fiction. For Gernsback, science fiction is a tool of invention, an imaginative prediction of where we might go, an inspiration for what we might do. Writing in 1923, Gernsback put it this way, "Every inventor must be a prophet. If he were not, he could not think up inventions that will only exist in the future. For this reason, every inventor must ascend from fact to non-fact. What non-fact will turn out to be, not even the inventor knows beforehand." Science fiction is thus a tool for the dissolution of the lie about the perversity of things. Science fiction allows us to overcome our own perversity so that we may learn and dream and plan for the future, so that we may shape the world into what we want and need it to be. Of course, this optimism about human inventiveness no longer seems as viable as it once did. The great killing technology of two world wars, the devastation of Hirsohima and Nagasaki, the long cold war, and the dissolution of objectivity and truth that plays out on our smart phone screens in the world of social media -- all of these things paint human invention in much darker hues than Gernsback ever seemed to have imagined. Yes, the drive for innovation is still there with results that often do better our lives, but over it hangs a shadow of death and inhumanity, of destruction and alienation. The wonder of Gernsback's scientifiction, and our science fiction, is its ability to capture the darkness as well as the light. From cold war aliens to cyberpunk pessimism to young adult dystopias, science fiction has proven itself more than capable of imagining the future, and technology's role in it, in ways more dark, and perhaps more realistical, than Gernsback ever imagined. It may turn out that he was wrong about the perversity of things after all, and that humanity's own perversions will invariably seep into the world around us and the things that we make. Grant Wythoff and The Perversity of Things reminds us of a moment in the past when the future still looked clear and bright. For that alone, it's worth the read.